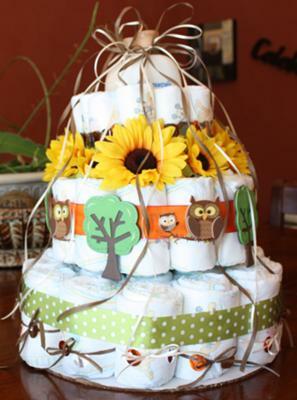 Love this Hooty Hoot Owl Diaper Cake! Classy flourishes, great colors, and a darling theme! Wendy has shared her creativity with all of us and has added her ideas to our reader-inspired collection of the best diaper cake ideas on the internet. 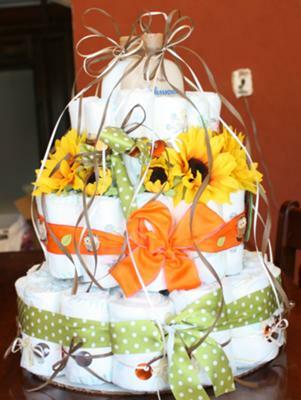 Thanks Wendy - your diaper cake is darling! I did this one a little different than all of my others. This is for a diaper baby shower; using size 3 because many people bring size 1 or 2 for the mommy-to-be again. Bottom layer, I used 3 diapers to create one rolled diaper. First roll one diaper up into a roll, then roll a diaper around the one that you just did, then the 3rd around the 2nd creating a larger roll. Second layer, same concept, just roll one diaper up, then roll another diaper around that one. Top layer, one diaper rolled up. This is probably my favorite one so far because it is different and unique! I do understand that these things are important, but dipper cake looks really weird at some point. Although I think it's sweet.